I think it was Ki who planted the idea in my mind. I never even tasted Hot Pepper Jelly before I made it yesterday so I didn't really know what to expect. However, the flavor I imagined was hotter than the reality of this batch. And if I had followed Ki's lead and used Habaneros I might have gotten the heat level I imagined. As it was, I intended to use 100% red ripe Serranos instead of the bell peppers plus 10 Jalapeños the recipe called for. I used the recipe from the leaflet in the Sure-Jell package (and on their website). They wanted a total of 4 cups of finely chopped peppers to 1 cup of vinegar, 5 cups of sugar and a packet of Sure-Jell. I thought by using all Serranos, seeded, I'd a have a pretty red jelly with pieces of pepper suspended in it (no seeds to ugly it up) and that surely 4 cups of Serranos, even seeded, would be enough heat. And maybe it would have been, but I only had enough Serranos for 3 cups and had to make up the final cup with ripe chocolate bell pepper plus a few assorted others. The color is pretty, just like I hoped for. Taste, well I don't know. I'm not all that keen on sweet sweet things and this has almost a cup of sugar in every jar. It does taste of peppers, with just a tiny little tingling of capsaicin. 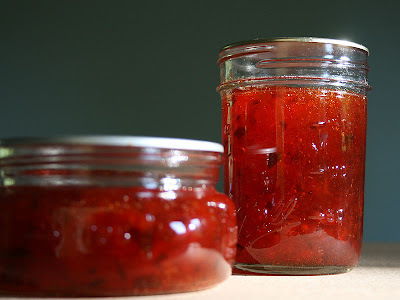 I tried it on toast this morning, and I'm not about to give up my hibiscus jam for this. I think it might have a future as an ingredient and not something to eat on its own. For lunch today, I mixed it with mayonnaise and coarse mustard as the dressing for a shrimp salad. I expect it would make a good base for a BBQ sauce, or a ham glaze, or maybe even for the sweetening in a mustard recipe I plan to try. Any other ideas?